Details of their plan will remain a secret until all is revealed at an upcoming press conference. 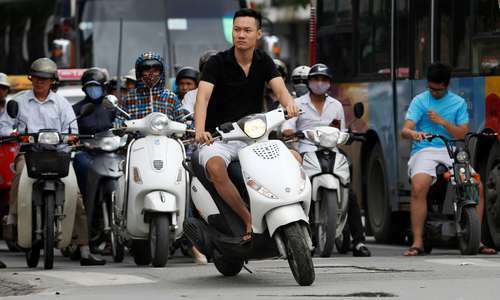 Authorities in Hanoi announced Friday the results of a competition it launched eight months ago to find a solution to its traffic problems. None of the entries were deemed good enough to bag the $200,000 first prize, but one team did secure a second prize of $100,000, according to Ngo Manh Tuan, deputy director of the city’s transport department. Each of the five remaining finalists were also awarded $25,000 each. The second prize team was made up of the Vietnam Institute for Urban and Rural Planning (VIUP), Nikken Sekkei Civil Engineering Ltd. (NSC) and Nikken Sekkei Research Institute (NSRI). 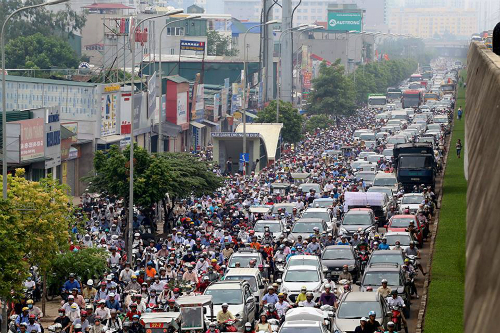 Traffic congestion in Hanoi. Photo by VnExpress/Ba Do. The awards ceremony on Friday was closed to the media. Speaking after the event, leaders of the city's transport department confirmed the results but refused to provide further information. A representative of the second prize team claimed they would reveal more details at a later press conference. Some of the team's solutions include synchronizing urban expansion with the expansion of the transport network and renovating the network for private vehicles. The team has also proposed developments to the capital's public transportation system and plans to convince the public to switch from using private vehicles to public transport. In January, Hanoi's Department of Transport launched the competition to seek solutions from members of the public to solve its serious congestion problems by 2025, with a first prize of $200,000 and a second prize of $100,000. The department asked contestants to focus on ideas involving underground parking spaces, smart transportation systems and ways to control private vehicles in a city dominated by motorcycles. The city in February selected six teams from more than 200 applicants to progress to the final round of evaluation. Statistics show that Hanoi has more than 5.5 million personal vehicles, including nearly 500,000 cars and more than five million motorcycles, and an average of over 19,000 new vehicles are registered each month. The numbers are expected to increase to more than 7.3 million motorbikes and 1.3 million cars by 2025.